HyperFair Raises $1.1 Million — Ready For Your Trip To A Virtual Trade Show? HyperFair, a startup with a platform for running online trade shows, says it has raised $1.1 million in seed funding. 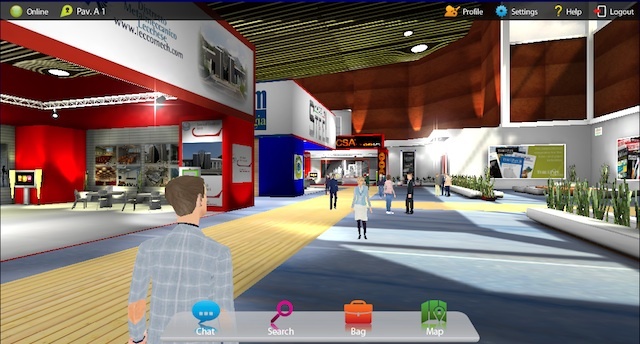 The idea of a virtual trade show isn’t new, but the practice hasn’t exactly taken off. Perhaps that’s what you’d expect, since it’s hard to imagine an online experience taking the place of a real-world show. However, I was impressed by the demo that COO Andrea Ballarini gave me last week. He said competitors tend to offer a much more static experience, and that’s true of the other services I’ve seen. HyperFair, on the other hand, promises more interactivity, and it allows you to move your avatar around a three-dimensional space. There’s also a simple, intuitive interface focused on the key tasks — chatting with other attendees (either via text, Skype integration, or voice), browsing products, and exchanging business cards. Ballarini also showed me the process of creating a virtual booth, which just takes a few minutes of uploading media to customize the look. Exhibitors can also upload multiple photos of their products to create a 3D model for display. The demo was good enough, at least, that I can imagine interacting on HyperFair without feeling totally weird. It’s hardly a replacement for in-person interaction, but then, Ballarini said that’s not the goal: “We’re definitely not trying to replace any physical event. We’re trying to expand the physical event.” For example, an organizer could hold a pre-show virtual event where attendees can get connected before meeting up in person, or a biennial conference could use HyperFair to keep attendees connected during the off years. HyperFair was launched in Italy, that’s where most of its current events are held (you can see a list here), but it’s looking to expand in the United States. In fact, Ballarini works with a small team out of RocketSpace in San Francisco. The funding comes from European angel investors. Ballarini said the round was actually raised earlier this year, but wasn’t announced in the U.S. until now. The company’s advisors include Lorenzo Thione, co-founder of Microsoft-acquired search company Powerset.